If you own a computer or other electronic equipment, you probably own a surge protector. Most surge protector designs serve an immediately apparent function, which is allowing you to plug various components into a single power outlet. But, there is much more to it than that. Surge protectors protect electronics from surges in electrical power. A power surge, which is also called transient voltage, is an increase in energy that’s above the average level of electricity flow. In typical office and household wiring in the US, the standard voltage is 120V. If it’s above 120V, that’s a surge, and surge protectors help in preventing that problem from destroying delicate electronics. It’s wise to know something about voltage before trying to understand more about surge protection. It’s a measure of the difference in the electric potential energy. An electric current travels from point to point as there’s a higher electrical potential energy on the originating wire’s end than on its other (outlet) end. It’s the same kind of principle which urges the water under pressure to flow out of the hose: a higher demand on the hose’s end pushes water toward a place of lower pressure. You may think of the voltage as the measure of the electric force. 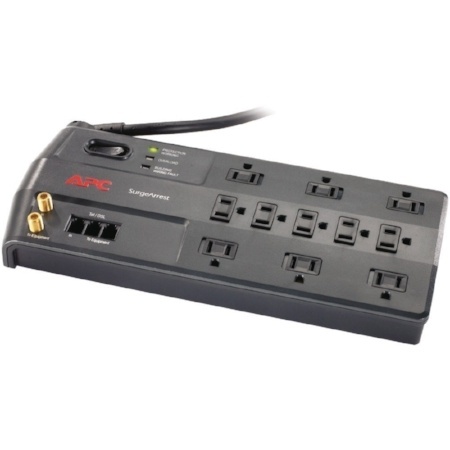 A typical surge protector passes the current along from an outlet to several electronic and electrical devices plugged into the power strip. Once the voltage to an outlet surges, the surge protectors divert extra electricity into the grounding wire of an outlet. In a basic surge protector, there’s a component known as MOV or metal oxide varistor, which diverts excess voltage and prevents damage to the electronics. When a home has a large appliance, such as an HVAC, which causes surges inside the home wiring system, these are also a threat to electronics. However, a whole house surge protector can divest the surge before it is allowed to ramp the voltage into other circuits. Also, you can get surge protectors specially designed for phone and cable lines. Just as everyone’s homes and electronic devices are different, do their need for surge protection will be different, but, ultimately, the more ‘layers’ of surge protection between a surge and your devices, the less likely they are to become damaged or destroyed. If you have concerns about your delicate electronics and power surges in your home or business, it may be time to talk to your electrician about whole-house surge protection.